This week, I listened to two artists that have returned to this place we call the music industry after at least a five year absence: David Bowie and Justin Timberlake. I thought it’d be fun to offer my thoughts on these wildly different artists whose only similarity is the proximity in which they released long overdue new material. Also, The Strokes! Here We Go! David Bowie has been around the block a few times. Throughout the years, he’s been an actor even when there weren’t any cameras in front of him (there usually were); his various personas always reflected the musical styles he flawlessly captured in his records. In The Next Day, it feels like all these personas were blended into one Bowie to Rule Them All (please humor me). Elements of glam guitar and stadium rock and roll permeate the album, but he still retains some of the sentimentality and piano-driven songwriting found in records like Heroes. 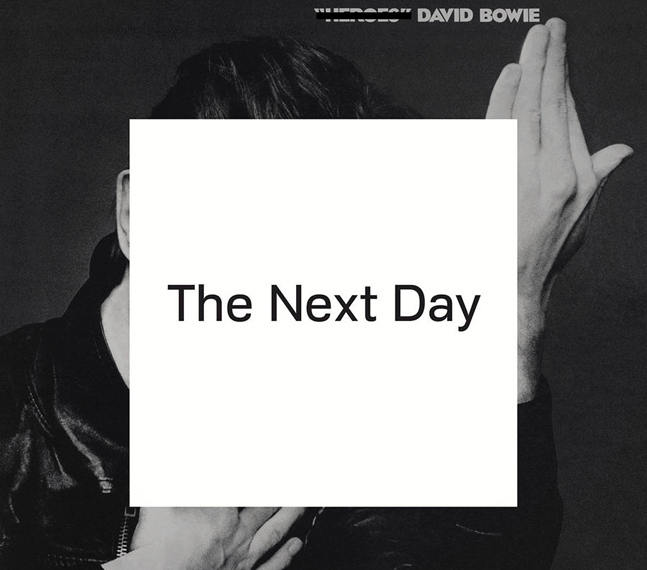 Bowie takes full advantage of the recording effects of the digital age that were previously unavailable to him to more effectively implicate his smaller idiosyncrasies in arranging and orchestration, and the record sounds beautiful production-wise. His vocal stylings and memorable lyrics are as present as ever, and the records overall theme of feeling left behind as the world continues to turn is especially heard in tracks like “Where Are We Now?”. A gorgeous and mounting ballad, the instrumental tracks sound as reflective and hauntingly beautiful as the lyrics and delicate vocals. On the other side of the coin is a quirky, fast-paced, almost progressive rock sound on tracks like “If You Can See Me”, which at first made me check to make sure a Yes track hadn’t snuck its way into my playlist. Tracks like these, I realized, were necessary to prevent the monotony that would have ensued, considering the mid-tempo nature of the majority of the record. After a five year sabbatical from the world of music –despite some SNL shorts– Justin Timberlake is back to doing pop music the right way. Much of the crisp, flowing, and utterly refined sound of both this release and Futuresex/Lovesounds is thanks to the brilliance of producer Timbaland, but to give him all the credit would be a diservice to J-Tim’s catchy and often clever lyrics, along with a wonderful set of pipes and all the right sensibilities. The record starts off with an orchestrated hurricane of strings that descends into a delightfully infectious groove in “Pusher Love Girl”. The otherworldly production and catchiness continues in first single “Suit & Tie” before descending into some deeper cuts. Similar to his last release, Justin seems to craft each song with a formula of intro,verse, interlude, then back to the verse, all seamlessly compacted into 7-8 minute packages. Each section is unique (feeling more like movements of a classical piece than parts of a pop song) but still holds pieces of the greater whole; this lengthy formula is unheard of coming from any other pop artist. 20/20 surpasses the already stellar Futuresex/Lovesounds in the pure variety of the record. While “Suit & Tie” and and “Don’t Hold The Wall” incorporate danceable beats and spacey instrumentation, tracks like “Pusher Love Girl” and “That Girl” bring bright guitar riffs and soaring vocal harmonies to a slightly more halting tempo. Beyond that, tracks like like “Spaceship Coupe” and the introspective “Blue Ocean Floor” offer something more in terms of brooding reverb and swelling synths. The two constants through all this variety is the exceptional vocals and production that sets Timberlake’s records apart. All in all, Justin Timberlakes 20/20 experience is one of the most refreshing records I’ve heard this year and has, in my opinion, surpassed his previous works. If you want to hear a modern R&B/pop masterpiece, give this record a spin; you won’t regret it. Here’s my favorite track (this was painful to choose), “That Girl”. They’re back. Before I continue, I just want to let you know, valued reader, that I love all of their material. Yes, that includes the less well-received First Impressions of Earth and their most recent album before this Angles. I am a huge fan with a huge bias, so take this review with a grain of salt. The most prominent thought I had throughout my listen-through of the album was this;”these guys have come a long way.” Each track, like Bowie’s record, seems to embody different periods in the groups career. 50/50 felt like Angles vocals collided with some of the slower tracks from First Impressions like “Ask Me Anything”, and “80’s Comedown Machine” feels almost like a Room on Fire B-side. Unfortunately, I don’t feel like these tracks live up to the entities they emulate, but the important thing is that every track is easily branded with a Strokes insignia. That being said, unlike the majority of previous releases, the record grooves. A lot. Some of the funky electronic qualities that first manifested in Angles are even more effectively incorporated in tracks like “50/50″, “Slow Animal”, and “Partners in Crime”. Some may see this as a departure from what makes The Strokes great, but I see these advancements and occasional delving into something closer to Julian’s solo material as a welcome freshness. This record is similar to Angles in that I feel like there is a track on here for everyone. Whatever you may feel for the Strokes, Comedown Machine has at least one track that will appeal to you. Even a poor misguided soul who was looking for a breezy jazz ballad in a Strokes record will find one in the final track “Call it Fate Call It Karma” (No, I’m not kidding). I enjoyed all of it thoroughly, and maintain that Julian, Albert and the boys still have something to offer to the world of music. Here’s my pick (and an excellent first track), “Tap Out”.